A flag of Usud al-Cherubim, using the cross in place of the initial 'alif in the word Usud. In a post in February 2016, a pro-Assad Christian page called Junud al-Massih ("Soldiers of Christ") wrote: "Syria is beautiful in its Assad. 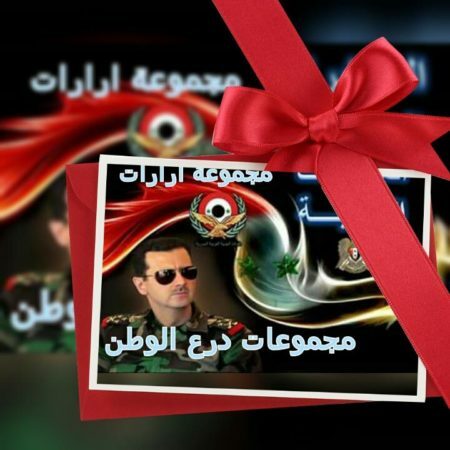 At your service in soul and blood, my lord President Bashar al-Assad. We began with 5 groups on the ground and today we have become more than 15 armed Syrian Christian factions." 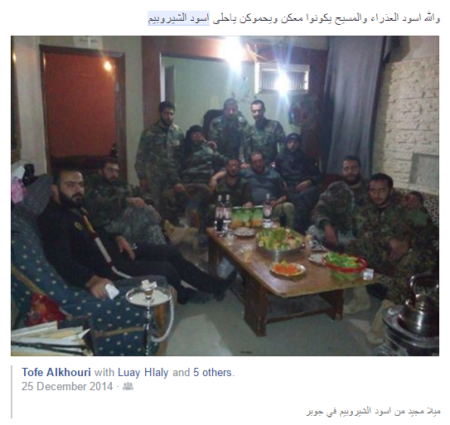 Though that post did not name any specific groups, perhaps the most recognisable Christian militia of pro-Assad orientation has been the Sootoro group in Qamishli in northeast Syria, a group I have discussed multiple times previously. However, there are much more obscure Christian formations that the Junud al-Massih page likely has in mind in its counting in that post, one of those groups being Usud al-Cherubim("Lions of the Cherubim"). The word "cherubim" in the militia's name can be seen as a double entendre. In the Bible, there are multiple references to the cherubim as beings associated with God (e.g. Ezekiel 10:2). 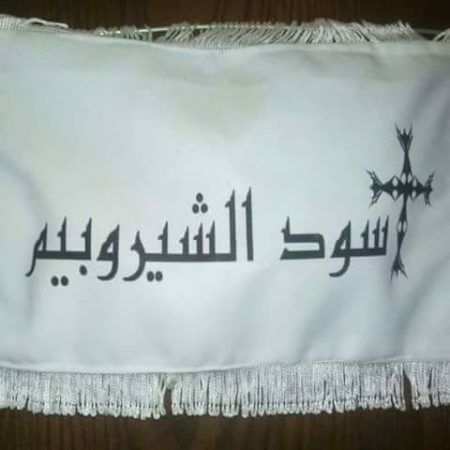 Yet looking at the Arabic orthography for the word "cherubim" in the case of the militia's name, there is in fact also an allusion to the Deir al-Cherubim ("The Cherubim Monastery," with Arabic spelling: دير الشيروبيم) near Saydnaya, which is best known as the site of the prison that housed many Islamists who were released in an amnesty in 2011 and went on to found key rebel groups like Ahrar al-Sham and Jaysh al-Islam. A fighter in Usud al-Cherubim confirmed to me that the group's name derives from Deir al-Cherubim. According to this fighter, Usud al-Cherubim was formed in 2013 during "the terrorist attack on the monastery" and the group lost a fighter called Joseph al-Kibba "in the battles of the monastery in defence of the monastery." For context, Joseph al-Kibba is a widely renowned Christian 'martyr' of the Saydnaya area who was born in 1989 and killed on 26 November 2013. His funeral was promoted in a video uploaded by the official channel of the National Defence Forces, which were reported to have played a role at the time alongside the Syrian army in fending off the attacks on Deir al-Cherubim. 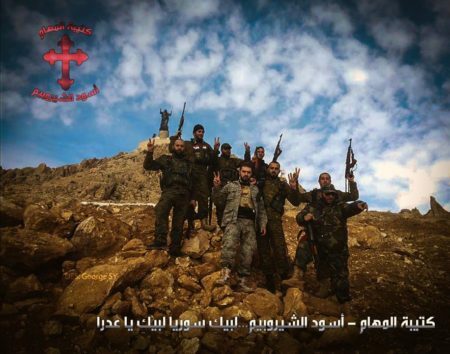 For their part, pro-rebel media during this period accused the regime of deliberately placing tanks near the monastery to bombard neighbouring areas, thereby attempting to score a propaganda victory against the rebels in their response to the bombardment. Public references to Usud al-Cherubim appear to go back as far as January 2014. Though the militia can be seen as initially having been set up as a local 'monastery defence' force, the group has subsequently participated in a number of military engagements beyond the Saydnaya area. According to the Usud al-Cherubim fighter, engagements have included "all the battles of East Ghouta, Darayya, Homs countryside, the battles of al-Qalamoun, and in Jobar in Damascus." In addition, Usud al-Cherubim has a "contingent in the north Hama countryside participating in the battles of honour." Some of these expeditions have been promoted on social media. For example, in September 2015, Usud al-Cherubim reportedly helped capture the hills surrounding the Christian locality of Maarouneh in the Damascus countryside, driving back the rebels to the Harasta highway and handing the hills to the Syrian army. In November 2015, the group was reported to be operating in areas of the Homs desert near al-Qaryatayn such as Mahin and Sadad, fighting against the Islamic State (IS). 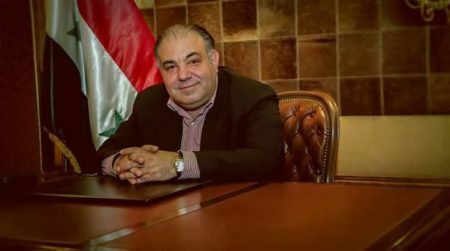 A number of other groups participated in the efforts to push back IS in the area, including the Syrian Social Nationalist Party's Nusur al-Zawba'a and Sootoro. Below is some photo and other media output associated with Usud al-Cherubim's operations. "Merry Christmas from Usud al-Cherubim in Jobar"- 2014. The Zilzal Jobar ("Earthquake of Jobar") contingent of Usud al-Cherubim. Its leader- Jihad Hilala- was reported in late February 2016 to have been wounded. 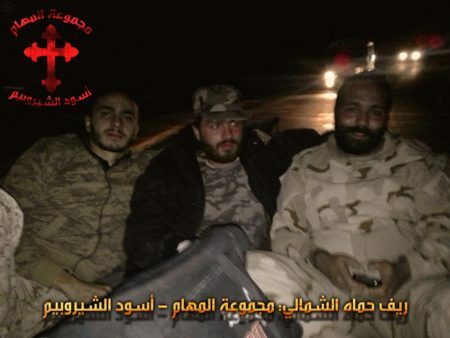 "Operations Battalion- Usud al-Cherubim- at your service Syria, at your service, ya Adra." Though Adra is the name of a town in the wider Damascus area, the invocation 'Ya Adra' normally refers to the Virgin Mary. Note the logo design featuring the cross in the top-left. "North Hama countryside- Operations Contingent- Usud al-Cherubim." "Operations Battalion- Usud al-Cherubim in Darayya." 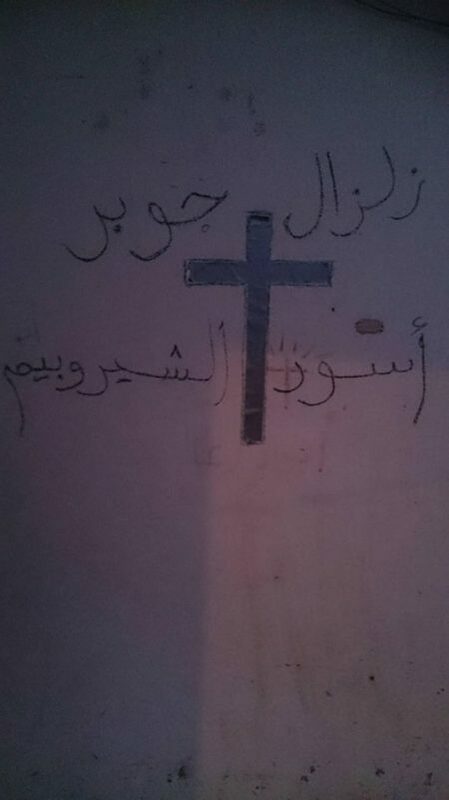 The participation in the Darayya operations was partly framed as "liberating its churches" (in a similar way, Shi'i militia participation in the Darayya operations was portrayed as defending/liberating the Sakina shrine in the area). The idea of holy struggle is also conveyed in the frequent self-description as "mujahideen of the cross." Usud al-Cherubim graffiti in Shebaa, East Ghouta. The graffiti, marked with the date 4 May 2016, reads: "Usud al-Cherubim: we are the descendants of Georgius [St. George]. We were not created to die, but rather we were created for eternal life." In total, the fighter from Usud al-Cherubim told me that the group has 3 'martyrs' and 12 wounded thus far. One therefore ought to keep the scale of the group's military contributions in perspective. 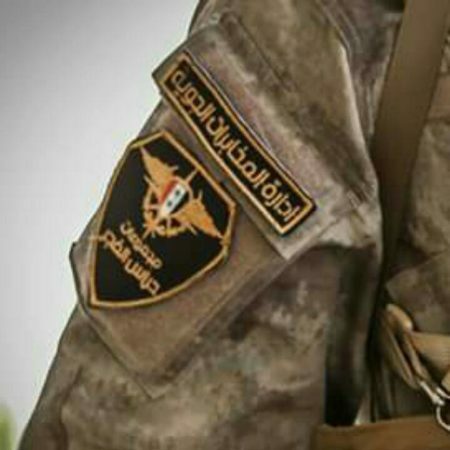 As for the militia's affiliation, the source stated that Usud al-Cherubim is affiliated with the air intelligence, with which a number of pro-regime militias have links/affiliation, including the elite Tiger Forces and the Suqaylabiyah-based Christian militia Quwat al-Ghadab. Indeed, a key to realizing the affiliation of Usud al-Cherubim with the air intelligence is that the group is referred to on social media as being part of Hurras al-Fajr ("Guardians of the Dawn"), which is a collection of primarily Christian militias affiliated with air intelligence. "Air Intelligence Administration: Guardians of the Dawn Groups. A homeland that we do not protect is one we do not deserve to live in." 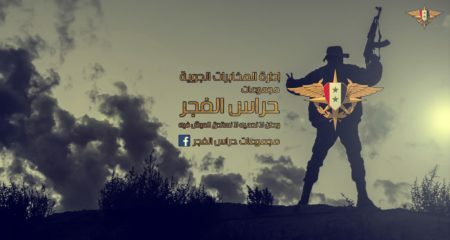 Like many pro-regime militias, Guardians of the Dawn has sought to recruit through Facebook, urging those wishing to join the ranks to correspond for inquiry and further information. 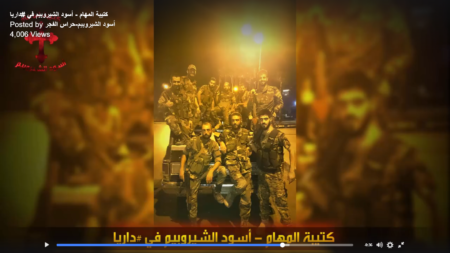 Of these groups, one should note that Usud al-Hamidiya-led by Rami Marina from Homs– appears to have left Guardians of the Dawn, and is now affiliated with the military intelligence under the formation of Fawj Maghawir al-Ba'ath ("Ba'ath Commandos Regiment") led by Jihad Barakat. According to an account by Guardians of the Dawn leader Fadi Abd al-Massih Khouri written in September 2016, the Guardians of the Dawn conglomeration was formally established on 11 September 2015, and Usud al-Cherubim had a key involvement in events that led to its establishment. 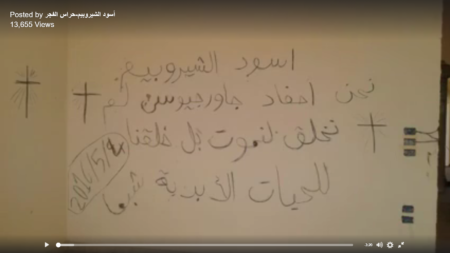 According to this account, Usud al-Cherubim issued a distress call to Khouri on Thursday night on 10 September 2015, warning that the locality of Maarouneh was under assault by Jaysh al-Islam, that the situation was difficult and that these rebels were threatening to seize the international highway. This prompted Khouri to make connections with the other groups (i.e. the constituents of what became the Guardians of the Dawn conglomeration) and set up the Intervention Regiment in particular. By 12 September 2015, Khouri claims to have set out with a contingent of fighters to provide relief. All this, he writes, is based on the idea that the groups should work to help each other out in times of distress as their villages come under assault. 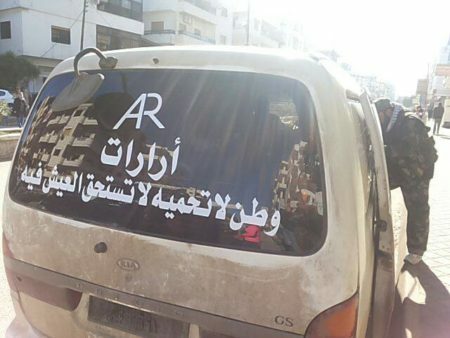 Although there is a nationalist line of rhetoric included in the account, with the affirmation that "all the land of Syria is our people and everyday someone seeks our help and of course we will heed the call," all the actual instances of relief provision named are Christian areas, "from Maarouneh to Sadad to Mahrada." Mahrada is a Christian town in Hama province that was threatened by some rebel advances earlier this year, prompting a mobilization including Guardians of the Dawn to defend it. Like many people involved with the militias on the ground, Khouri attempted to push for political influence by running as a parliamentary candidate for the April 2016 elections. However, unlike Liwa al-Baqir's Omar al-Hassan, he was unsuccessful. Social media graphic: "Ararat Group: Dir' al-Watan Groups." Dir' al-Watan ("Homeland Shield") appears to have been the initial name for Khouri's conglomeration of militias, though having the same air intelligence affiliation. In relation to the Sadad operations in November 2015, Sootoro wrote: "Dir' al-Watan. Entering Sadad. Big thanks from all the groups to Ustadh Fadi Khouri for his support and great work." Thus, this Dir' al-Watan should not be confused with the Dir' al-Watan of the al-Bustan Association, or the Dir' al-Watan in Suwayda'. As an actively used and promoted brand on social media for Khouri's conglomeration of militias, Guardians of the Dawn does not seem to appear initially until March 2016. Ararat Group, using a slight variant on the Guardians of the Dawn slogan: "A homeland you do not protect is one you do not deserve to live in." In short, the case of Usud al-Cherubim provides an interesting case of evolution from a local initiative to an affiliate of a wider militia conglomeration attached to the air intelligence. The existence of Usud al-Cherubim also illustrates that notions of defence of holy sites as rallying calls are by no means limited to the Shi'a alone. Indeed, as the case of the Syriac Military Council demonstrates, the idea of defending churches and other holy sites from desecration and destruction has been an important talking point among Christians in the east of the country as well. Of course, Usud al-Cherubim goes beyond mere defence of the Deir al-Cherubim monastery, and has been actively fighting for the regime elsewhere in western Syria. The developments surrounding Guardians of the Dawn also point to wider trends among pro-Assad militias: namely, a desire to assert political influence (while not threatening Assad's position as president of Syria) and competition for power on the ground (which, in the case of the various intelligence agencies in particular, also represents continuity with the past).